On Friday May 25th, 2012 @ 10:30AM, several of us from the Yukon to Germany, from Ottawa to Switzerland, stopped whatever we were doing, ran to our computer and called up the Governor General’s website. 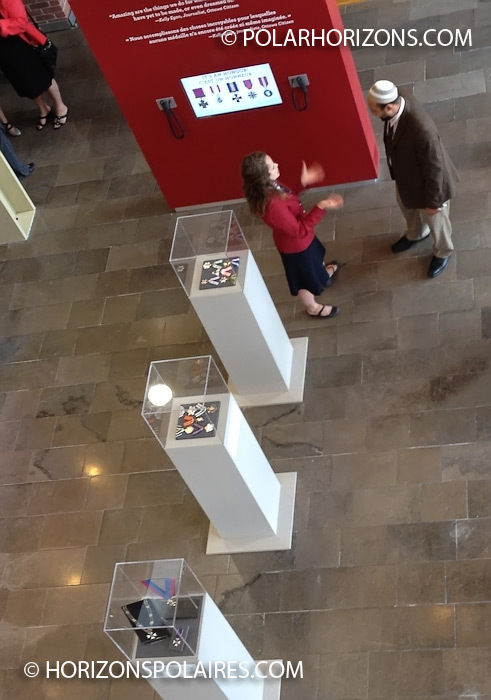 In a few minutes, our friend Hans-Ludwig Blohm, was to officially become a Member of the Order of Canada, and we could watch the ceremony live! What an exciting moment! Hans-Ludwig Blohm has helped to protect, preserve and promote Canada’s northern culture through his camera lens. 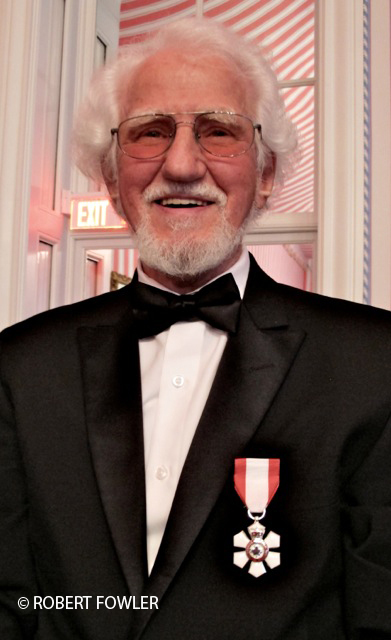 An acclaimed photographer, he has travelled extensively throughout the country’s northern regions, capturing images and stories of the Inuit, and chronicling the lives and events that have shaped the region. His exhibitions, which also feature his innovative work in microchip photography, have toured the world, while his photos have graced the pages of many books, magazines and Canadian postage stamps. I just couldn’t resist taking a few shots of my computer screen. 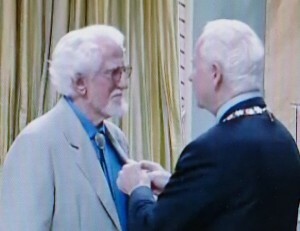 Hans then joined the Governor General to receive his medal. Both men turned towards the event’s official photographer to have this moment immortalize. I’m sure that, for a few seconds, Hans was brought back to Nov 24th, 1967 as he was one of the few accredited photographers covering the very first Order of Canada investiture ceremony. 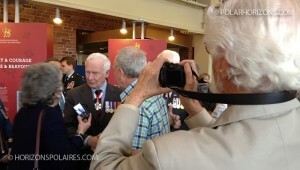 Here’s the link where you can see the official photography of Hans shaking hands with Governor General David Johnson. 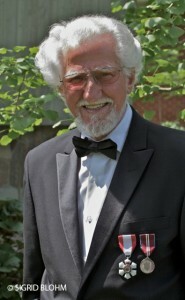 Hans Blohm, Member of the Order of Canada. To my great surprise, the Governor General came over to our table after the evening’s dinner – before coffee and dessert- and presented me to my utter surprise with my second medal of the day: The Queen’s Diamond Jubilee medal!! The task before us is to make sure that we prepare the next generation—the Order of Canada recipients of the future—to take their places in society, to discover their own greatness and to contribute to our national identity in their own unique ways. There is no doubt in my mind that Hans will live up to those expections. It is always with great pleasure that he shares his experiences and knowledge and transmits his passion. 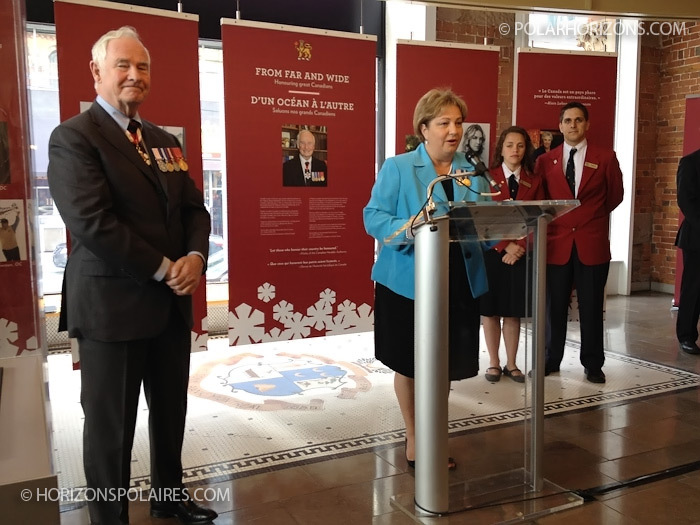 Less than a week before the investiture ceremony, I had the privilege of accompanying Hans to the official opening of the From Far and Wide – Hounouring Great Canadians exhibit. Interpretative panels of the National Honours exhibit. Even though Hans was invited to attend the ceremony as a guest, it is impossible to take the photographer out of him!! While the medias were standing in the small area that had been reserved for them in the centre of the room, Hans was everywhere! On the second floor, watching the arrival of the Governor General so that he could capture him with the parliament in the background. 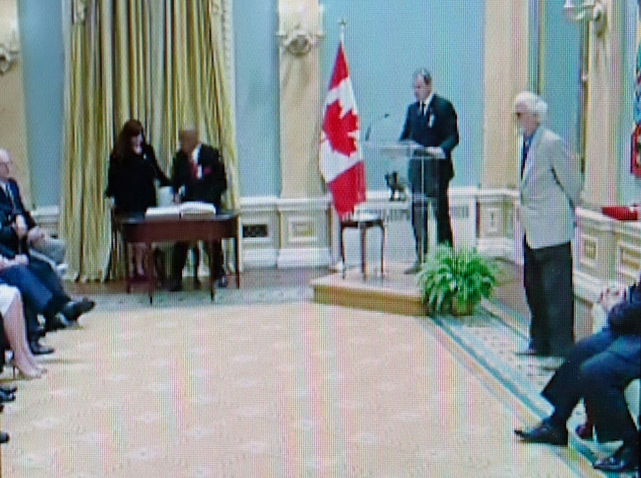 In the staircase, taking a general view of the event during the Governor General’s speech. By the time the Governor General was ready to cut the ribbon, Hans had made his way across the room and appeared on the side ready to shoot. It was fascinating to watch him work!! Hans had simply brought a small point-and-shoot camera and all I had was my iPhone but I nevertheless had fun trying to capture him at work! 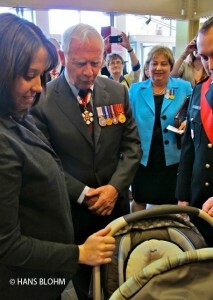 Governor General David Johnson congratulating a Canadian military on his newborn baby and on the recognition he was awarded. 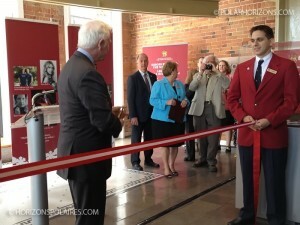 His story is one that was selected to be highlighted in the exhibit. It was a challenge to navigate in the crowded room and get a good composition. By following Hans discretely (well! 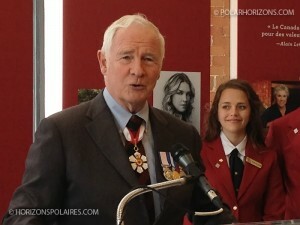 As the above picture as was not always as discreet as I should have been ;-)), I was hoping to be in the proper place if the Governor General ended up talking to him. But, at some point, I got distracted for a few minutes. Well! Guess what? That’s exactely when the Governor General stopped and shook Hans’ hand and exchanged a few words with him. I missed the shot I was looking for! Hans only told me a few days later. I guess I’ll have to continue observing the pro and practice !! Besides photography, one thing Hans taught me is that if you have a project at heart, take it in your own hands! Don’t wait and rely on others! Take the lead and do everything you can to make it happen! That’s Hans’ recipe for realizing several of his achievements, namely his book “Pebbles to Computers” which required him to travel to 13 countries over a six years period. 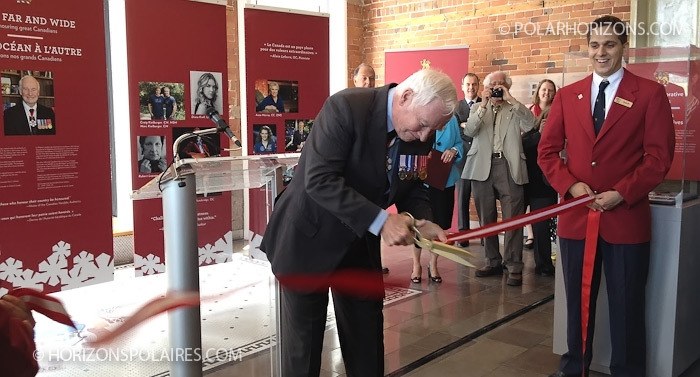 The book was also turned into a one hour TVOntario documentary as well as an international exhibit with four copies circulating simultaneously on four continents! Understandably, it became one of the achievement he is most proud of. Since 1967, over one million Canadians have been honoured with awards, medals and decorations! There are so many inspiring stories to discover! If you know of someone who has made a significant contribution, don’t be shy to nominate them. It all starts with people like you & I submitting a name to the Chancellery of Honours. 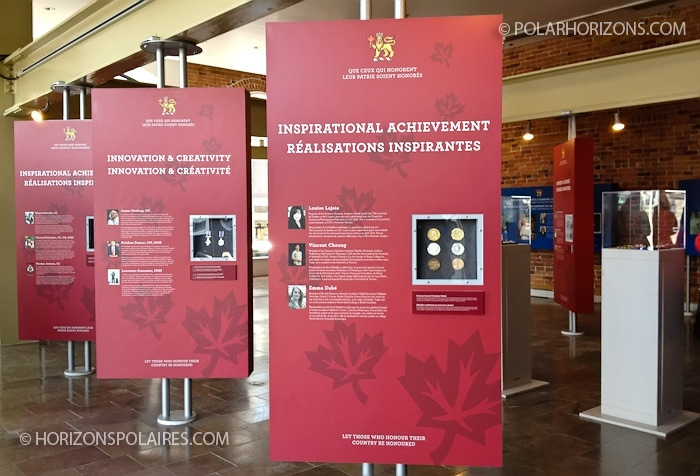 If you’re in the neighbourhood, go visit this new exhibit on National Honours. Be inspired by the stories of several Canadians from across the country and from all walks of life. The exhibit is being presented until November 2012 in the building just across from Parliament Hill (90 Wellington Street) in Ottawa.